Rated 5 out of 5 by Vietmom2 from Fantastic hand towel replacement We use this when there is illness in the household and when we have large groups of people on our home. We immediately put away all of the hand towels and place these out. It gets the job done and keeps the germs from spreading. The only additional feature I wish this had would be a punch out hole on each side for replacement in the paper towel holder (the ones that allow the paper towel to hang down). This would allow for me to use this in the kitchen as well. Rated 4 out of 5 by BeBeVP from I really love these towels, but are for me to find I find these very sanitary and convenient. It is a must have. Rated 5 out of 5 by Chrissimcp from Are these being discontinued?! Please tell me know. I love them for our 1/2 bath! 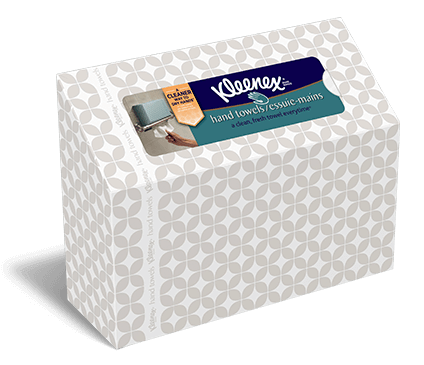 Rated 5 out of 5 by Eliz from Kleenex hand towels is the greatest, I use these regularly, the cloth is strong for many uses. I like the box good for easy access when put in the towel rack Please put this back on the market or let me order direct from kleenex.